GPS Flight Planning – WAAS Going On? It’s time to review the rules for planning an IFR flight with GPS navigation. Maybe the airplane has an old receiver without WAAS capability. Or maybe the rules have changed too many times to remember the current limitations. Where to find the answers? I’m starting with destination rules, because most flight plans begin with that basic question: Where to go and how to get there? 2013 – If you were aware of these rules a couple years ago, you knew to look them up in Published NOTAM No. GEN13000. That notice expired in 2014. 2014 – AIM 1-1-18(g)(1) superseded the obscure notice, making the alternate airport rules somewhat easier to find. 2015 – The published 2015 FAR/AIM is already obsolete because the rules changed again on 8 January 2015. Now, one must look for AIM 1-1-18(b)(5)(c). Pilots may plan for LNAV or CIRCLING minimums only, unless equipped for baro-VNAV. A preflight RAIM prediction for the destination or the alternate airport is required. The M.A.P. Study Guide is a list of notes I first developed during instrument-flight-instructor training because I needed a concise explanation of various approach profiles. Now that I’m considering airline jobs, I’ve decided to adapt my study guide to the chart format used by Jeppesen, which is also used by many airlines. I find the missed approach procedures slightly more intuitive in the Jeppesen format, but it also presents more information that can become overwhelming at first. You might also want the FAA charts format of the study guide. The M.A.P. Study Guide is a list of notes I first developed during instrument-flight-instructor training because I needed a concise explanation of various approach profiles. Now that I am instructing instrument students, it seems this guide is the best tool for teaching missed approach identification with FAA charts. The Missed Approach Point and Missed Approach Track symbols on each chart profile can mean different things depending on the type of procedure. You might also want the Jeppesen charts format of the study guide. Starting with the current chart cycle from August 22, the radius of protected airspace for new circling approach procedures has increased. This change will mainly affect airplanes in approach categories B through D.
While the procedures are flown in the same way, the requirements for a larger protected airspace may result in higher altitudes being flown. For example, if your destination is the Traverse City (KTVC) GPS RWY 36 approach, the category C minimum descent altitude (MDA) has increased from 1,280 ft to 1,500 ft. The category D MDA changed from 1,300 ft to 1,720 ft, and so on. 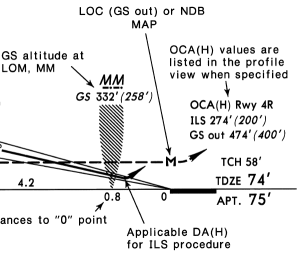 The good news is that this approach was also revised to include an LPV descision altitude of 898 ft.